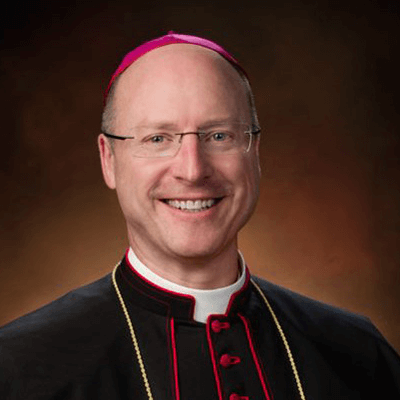 Why has the Diocese decided to change the age of Confirmation? For some time, clergy and parish catechetical leaders have expressed a desire to lower the age of Confirmation. While many reasons were cited, the two main reasons justifying a lower age were 1) a strong desire to offer the graces of the sacrament to young people earlier and in closer proximity to their baptism, and 2) to prepare young people and their families during a more pragmatic and less busy time of their lives. As our youth enter adolescence their schedules, involvements, commitments and pastoral needs increase in degree and complexity. Inviting young people to receive those strengthening graces at a more pragmatic time will help fortify them as they encounter the trials and challenges of young adulthood. Why has 7th grade (12 years old) been selected as the preferred age at which to confer the sacrament? Middle school offers a more pragmatic time where young people are starting to come of age and grow in personal and spiritual maturity. When prepared in developmentally appropriate ways, middle schoolers can comprehend the more abstract theological components of the sacrament in a way that younger students may not. Middle schoolers can also benefit from opportunities to encounter Christ more fully through the preparation and reception for the sacrament. A preparation process that provides an encounter with the Holy Spirit through retreats, service project, prayer experiences, or community involvement can help galvanize a young person’s faith and properly dispose them to receive the graces of the Sacrament. It avoids the “graduation mentality” associated with 8th grade, and engages them before the business and trials that accompany high school. When will the age change be implemented? The current 2019/2020 Confirmation cycle will NOT have any changes. The preparation and celebration of Confirmation will continue to take place as already planned in accordance with current practice (16 or 17 years of age). However, if a parish would like to begin preparing and confirming high school aged youth they may do so at this time. But no change is otherwised required. For the 2020/2021 Confirmation cycle, all high school students not already Confirmed will be prepared and confirmed. For the 2021/2022 Confirmation cycle, all 7th, 8th and 9th grade students will be prepared and confirmed. For the 2022/2023 Confirmation cycle and following, the age of Confirmation will be 7th grade. Could we just start confirming younger ages this confirmation cycle (2019/2020)? Yes. Should a pastor and catechetical team decide it is in the best interest of their parish to begin preparation and confirmation of younger grades this cycle (2019/2020) they may do so. My parish is HUGE! How can we expect to confirm all our high schoolers or all our middle schoolers in a single year? The transition plan recognizes that for some parishes, the prospect of confirming all high schoolers or middle schoolers in a given year is impractical and overwhelming. There may be some larger parishes who need a protracted timeline to implement this change. That may mean, for example, that only 11th and 10th graders are Confirmed in 2019/20 followed by 8th and 9th graders the following year, and so forth. 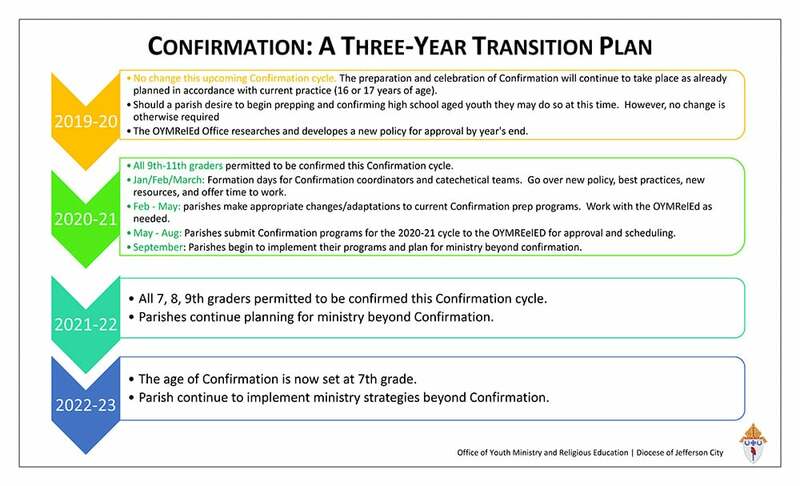 Should you feel that your parish needs a more protracted timeline to implement this transition please contact the Office of Youth Ministry and Religious Education for consult. My parish is quite small. Would it be ok if we just went ahead and confirmed all our 7-11 graders this year? Due to the wide range of developmental abilities and maturity levels, it is not advisable to prepare such a wide range of young people in the same program. It is advised that parishes first confirm all high schoolers followed by all middle schoolers the next cycle. My parish confirms every other year. How will this be effected? During the transition, parishes that typically confirm every-other year may find it advantageous to confirm every year until the preferred age of 7th grade has been reached. It might mean that your parish confirms kids for one or two consecutive years after which you go back to an every-other-year schedule. Some parishes may find that they are be able to move to an every-year schedule because they have larger numbers of seventh graders participating in parish life. Others may wish to stick to every-other-year and confirm seventh and eighth graders together. What role will my Catholic School have in preparing young people for the sacrament? The exact role that Catholic schools have in preparing young people for the sacrament remains to be fleshed out. On the one hand, parents send their children to a Catholic school so they can receive instruction in the faith, and this should include sacramental instruction. For example, many schools currently offer prep for first communion and first reconciliation. On the other hand, the role of the parish and the wider community is essential to the preparation process. Young people need to be formed within and supported by the primary sacramental community of which they are a part…the parish. As we revise the confirmation policy in the year ahead, we will be exploring this question more deeply. It is our hope to offer a balanced and integrated model for preparation in both parish and school communities. Does this change effect RCIC (Roman Catholic Initiation for Children)? No. Children over the age of seven who have not been baptized and express a desire to enter the Catholic Church will still go through the RCIC process and receive the sacraments according to the Catechumenate model as is currently the practice of the Church. Won’t lowering the age de-incentivize kids from continuing to come to church? Often, we run the risk of using Confirmation as a “sacramental incentive” to keep kids and families involved through high school. In some parishes, the only thing offered to adolescents is Confirmation prep. Many programs employ a school-based model for sacramental preparation which includes mandatory classes and a check-list of requirements young people must complete in order to “earn” the sacrament much in the same way they “earn” graduation in school. When confirmation is approached in these ways and not properly integrated into a long-term, comprehensive faith formation strategy aimed at equipping parents and facilitating discipleship, the result is often a “graduation” from parish life. That is why we cannot simply change the age and expect better results. In the year ahead, we will be exploring new, effective models for Confirmation prep, best practices and resources, and working with parishes to help them develop a comprehensive strategy to engage young people and their parents before, during and beyond Confirmation. How does the diocese plan to support parishes as they transition to the lower age? In the years ahead, the Office of Youth Ministry and Religious Education will be available for questions and consultation. We will be organizing several formation days and meetings to walk through new policy changes, discuss effective practices, share new resources, and accompany confirmation coordinators and parishes through this transition process.